Opponents of jailbreaks claim that jailbreaking is only used for software piracy. Those of us who have had jailbroken phones in 2007, before Apple launched its own App Store, know that this is not necessarily the case. Nevertheless, it is a fact that a lot of iPhone users turn to jailbreaking to access commercial apps without compensating the developers. So, although I am opposed to the practice, I can’t help but smile when another useful service is used for illicit purposes. A Russian hacker, who goes by ZonD Eighty, has set up the In-Appstore proxy server which circumvents in-app purchases. 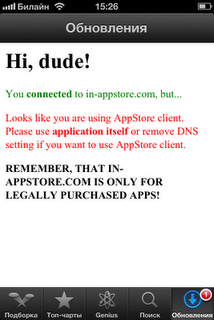 If you sign in to ZonD Eighty’s proxy server, in-app purchases will charge no money. This method of piracy does not even require a jailbreak and works for most (but not all) apps from iOS versions 3-6. If you want to have a sketchy Russian piracy server intercept information that you would be sending to the iTunes Store, you are currently out of luck. The proxy server is apparently down, supposedly due to high load. The author is looking for donations to beef up their offshore server, so they can serve more demand for in-app purchase piracy. The ability to assign a proxy isn’t just useful for stealing apps or tricking Netflix into thinking you live in the United States. Proxies are used as gateways to secure networks, to maintain privacy, and are also used for various IT purposes. If Apple removes the ability to assign DNS proxies, it could hurt the iPhone’s attractiveness to enterprise buyers. Instead expect to see a lot of “security and stability” updates within popular apps. I can’t recommend using this service for multiple reasons, but its good to see examples where piracy and jailbreaking are not synonymous. You can share your thoughts in the comments section below. And what about iAP cracker? Is it any good? what it actually does (to my understanding), it’s creating a fake receipt for the in-app store. 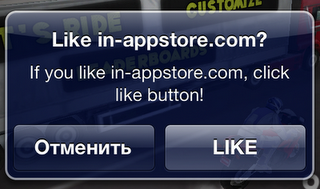 iAP free works for almost every app. TAKE IN MIND THOUGH, that most of the new apps won’t support it, because they kind of figured out how to block the option of fake receipts. i can not download, i got the message like in the picture above, help?